Maybe it was all the buzz about the Amazon Spheres finally opening that got me too excited. A visit to The Spheres Discovery at Understory, a tiny portion of the building that opened to the public today, left me rather underwhelmed. I know, I know. This is a corporate building, not a theme park, but still! Nowhere from this enclosed space you can get a peek of what Amazonians get to see. In fact, you are better off standing outside the building and looking through the glass if you want to spot any Amazonians inside their private jungle. Understory, however, is quite an informative exhibit, especially if you are into plants or architecture. The display helps you understand how a perfect globe can be constructed and shows what type of big trees have been brought inside, such as a “magnificent Rusty Fig,” nicknamed Rubi, that was planted in California back in 1969. 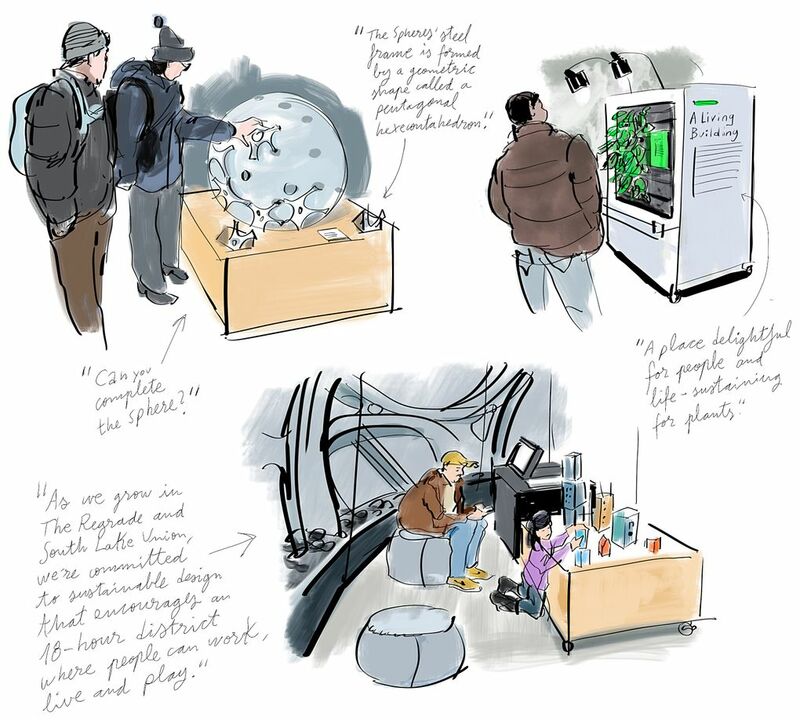 In my sketches you can see some of the things that caught my eye: a station with a big dome that you can cover with pieces resembling the real steel members that support the structure, a sample of the Spheres “living wall” and a station with wooden blocks for kids to play with. I also drew a wider view of the space as visitors roamed around and took photos and videos. 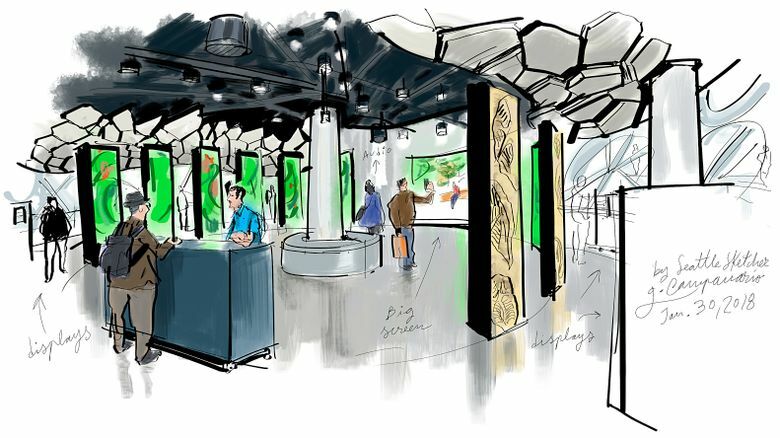 A big screen is located in the center of the space and surrounded by a dozen of vertical screens where images of plants are projected. At times the main screen showed recorded video of Amazonians walking through the Spheres’ canopy or sitting in nooks and conversing with each other. That sure helps you imagine what it’s really like inside. 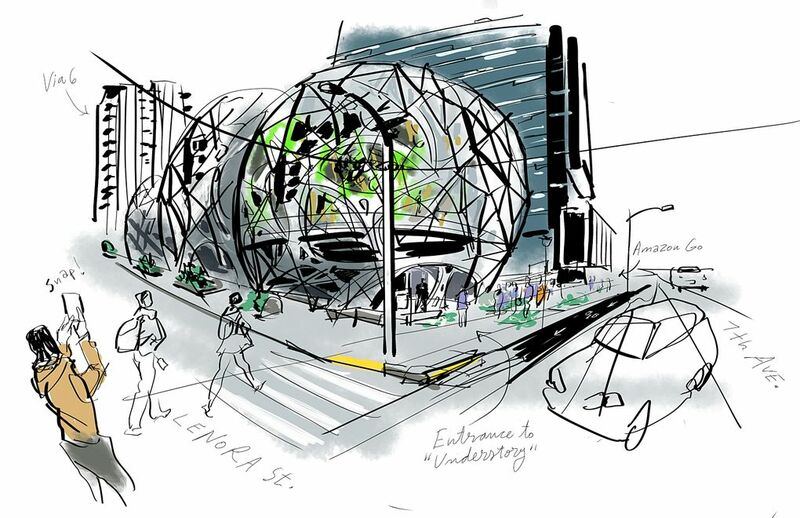 Since the whole point of the Spheres is to foster a connection with the natural world, I hope the Amazonians who get to enjoy them will be inspired to explore the true nature that awaits outside their innovative urban campus. I know from experience that there’s nothing like a visit to the Sound or a park to get your creative juices flowing. P.S. Remember when I sketched the Spheres as they were being built? Check here and here to take a look.